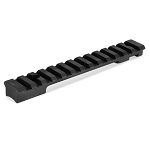 Announcing the NEW AND IMPROVED Mini-Scout-Mount ™for M14-M1A Rifles. We combined the proven features of our M-14 model Mini-Scout-Mount ™ with the SOCOM model, then shaved off 2.25 ounces and added more Picatinny top rail. Now the same model will fit both the Mil-Std M14 barrels and the newer production SOCOM style barrels offered by Springfield Armory, Smith Enterprises, and others. 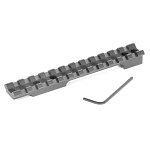 This rugged aluminum and stainless steel unit bolts on with NO modifications and features a full-length Mil-Std 1913 Picatinny rail on top. Now you can mount a modern tactical sight system such as Red-dot/ Holographic sight or Extended Eye Relief (EER) scope which will give you the fastest target acquisition possible with this proven battle rifle. 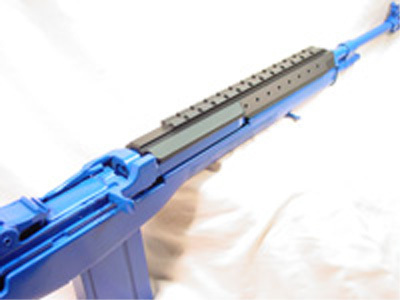 Yet the mount will not preclude the use of iron sights, or interfere with receiver-mounted scope bases. 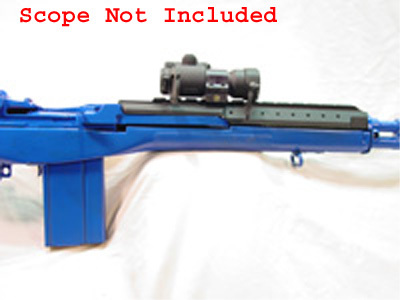 It will NOT fit Chinese made barrels or "Loaded" M1A's with their medium-heavy or heavy barrels. All Stainless barrels are "Heavy" barrels, and will not fit. 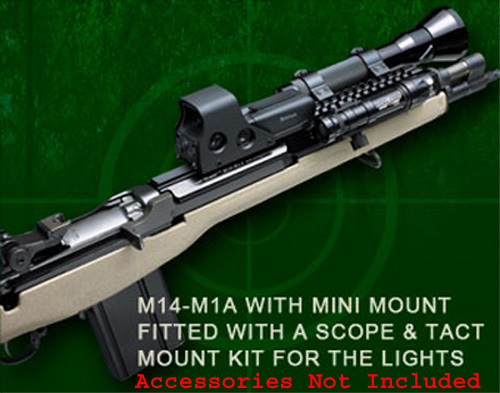 The new, lighter M14-M1A Model accepts all of the Tactical Light Mount Kit ™ for quick and secure mounting of tactical flashlights, laser sights and other accessories. 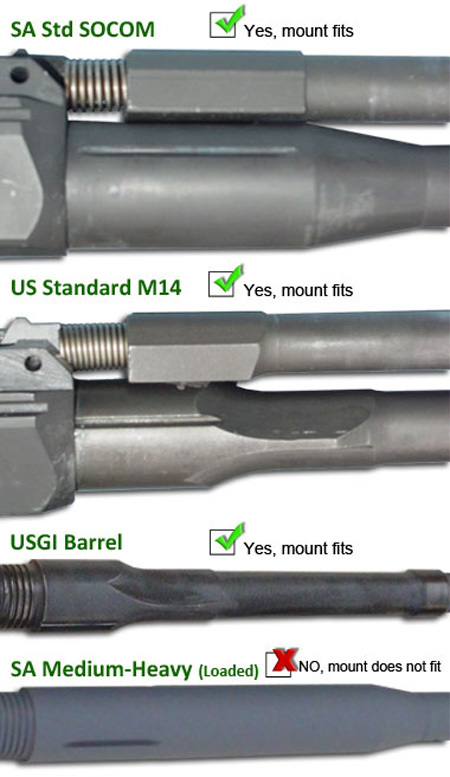 NOTE: Chinese manufactured barrels LOOK like the US Mil-Std M14 Barrels, but are not the same dimensions. NONE of our mounts will fit a Chinese made barrel. Our mounts only fit US made standard weight barrel, but will not fit the "MEDIUM HEAVY" or heavier barrels. Note: All Stainless barrels are "Heavy" and will not fit. Make sure you order the right mount for your barrel. See the photographs to identify your barrel.